The instrument is composed of a long steel rod which has two sights at its opposite ends. 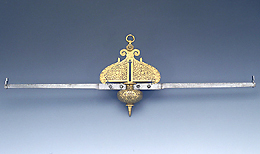 At the centre of the rod, in its lower half, is a large weight with a decorated and gilded surface, which maintains the instrument in a horizontal position. Two opposite triangles are situated in the upper half. Their sides are bounded by graduated horizontal and vertical slots. Two finely decorated dolphins are engraved on the hypotenuse. Steel screws, along which cursors could move, were originally placed in the four slots, which are now empty. The surface of the triangles is gilded and richly decorated. The perpendicular could be used to level planes, make height measurements and calculate proportions between different heights. The instrument is unsigned.